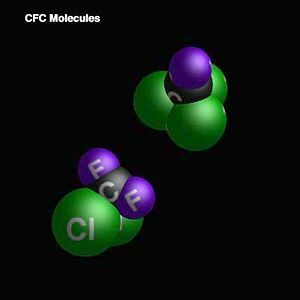 Molecules of chlorofluorocarbons (CFCs), which were once used extensively as refrigerants. A refrigerant is a substance that is used to provide cooling through a heat cycle in which the substance undergoes changes in phase from gas to liquid and back to gas. Refrigerants are used mainly for refrigerators, freezers, and air conditioners. In early refrigeration systems, the refrigerants employed were sulfur dioxide or anhydrous ammonia gas. These were later replaced by chlorofluorocarbons (CFCs) under the trade names Freon and Arcton. However, based on the understanding that CFCs in the upper atmosphere destroy the protective ozone layer, they are considered as environmental hazards. Recently, they are being replaced by alternative refrigerants. The ideal refrigerant has good thermodynamic properties, is noncorrosive, and safe. The desired thermodynamic properties are a boiling point somewhat below the target temperature, a high heat of vaporization, a moderate density in liquid form, and a relatively high density in gaseous form. Since boiling point and gas density are affected by pressure, refrigerants may be made more suitable for a particular application by choice of operating pressure. Corrosion properties are a matter of materials compatibility with the components used for the compressor, piping, evaporator, and condenser. Safety considerations include toxicity and flammability. Class 1: This class includes refrigerants that cool by the absorption or extraction of latent heat from the substances to be refrigerated. Class 2: These refrigerants cool substances by absorbing their sensible heats. They are air, calcium chloride brine, sodium chloride brine, alcohol, and similar nonfreezing solutions. The purpose of Class 2 refrigerants is to receive a reduction of temperature from Class 1 refrigerants and convey this lower temperature to the area to be air-conditioned. Class 3: This group consists of solutions that contain absorbed vapors of liquefiable agents or refrigerating media. These solutions function by nature of their ability to carry liquefiable vapors, which produce a cooling effect by the absorption of their latent heat. Early mechanical refrigeration systems employed sulfur dioxide gas or anhydrous ammonia, with small home refrigerators primarily using the former. As sulfur dioxide is toxic, it rapidly disappeared from the market with the introduction of Freon. Ammonia is still used in some large commercial plants, well away from residential areas, where a leak will not cause widespread injuries. Until concerns about depletion of the ozone layer arose in the 1980s, the most widely used refrigerants were the halomethanes R-12 and R-22 (see the numbering system below), with R-12 being more common in automotive air conditioners and small refrigerators, and R-22 being used for residential and light commercial air conditioners, refrigerators, and freezers. Some very early systems used R-11 because its relatively high boiling point allows low-pressure systems to be constructed, reducing the mechanical strength required for components. Based on environmental concerns (see below), new production of R-12 ceased in the United States in 1995, and R-22 is to be phased out in 2010. R-134a and certain blends are now replacing chlorinated compounds. One popular 50/50 blend of R-32 and R-125 now being increasingly substituted for R-22 is R410a, often marketed under the trade name Puron®. Although the R-22, R-12 and other ozone-depleting refrigerants are being phased out, they still have value and can be easily sold. Use of highly purified, liquefied propane gas as a refrigerant is gaining favor, especially in systems designed for R-12, R-22 or R-134a. As such, it is designated as R-290 and marketed under the trade name Duracool®. Although propane is flammable, in home and automotive systems it is present in quantities small enough to not pose an undue fire hazard if a system should develop a leak. Moreover, propane is nontoxic. An odorant, such as ethyl mercaptan, can be added in trace amounts to alert persons of system leaks. Emissions from automotive air-conditioning are a growing concern because of their impact on climate change. From 2011 on, the European Union will phase out refrigerants with a global warming potential (GWP) of more than 150 in automotive air conditioning (GWP = 100 year warming potential of one kilogram of a gas relative to one kilogram of CO2). This will ban potent greenhouse gases such as the refrigerant HFC-134a—which has a GWP of 1410—to promote safe and energy-efficient refrigerants. One of the most promising alternatives is the natural refrigerant CO2 (R-744). Carbon dioxide is non-flammable, non-ozone depleting, has a global warming potential of one, but is toxic and potentially lethal in concentrations above five percent by volume. R-744 can be used as a working fluid in climate control systems for cars, residential air conditioning, hot water pumps, commercial refrigeration, and vending machines. CFCs or chlorofluorocarbons are used as refrigerants in some commercial air conditioning and refrigeration systems. CFCs are considered to be 100 percent ozone depleting and are very dangerous to the environment. In most residential air conditioners and many refrigeration systems it is R-22 or Freon which is a hydrochlorofluorocarbon or HCFC. HCFCs are considered to be five percent ozone depleting and are also a danger to the Earth's vital ozone layer. As of July 1, 1992, it is illegal to release Freon or other refrigerants into the atmosphere because they can cause severe damage to the ozone layer. When CFCs are removed they should be recycled to clean out any contaminants and return it to a usable condition. Refrigerants should never be mixed together. Some CFCs must be managed as hazardous waste, even if recycled and special precautions are required for their transport. Rightmost digit: Number of fluorine atoms per molecule. Tens digit: One plus the number of hydrogen atoms per molecule. Hundreds digit: The number of carbon atoms minus one. Omitted for methyl halides, which have only one carbon atom. Thousands digit: Number of double bonds in the molecule. This is omitted when zero, and in practice is rarely used, since most candidate compounds are unstable. A suffix with a capital B and a number indicates the number of bromine atoms, when present. This is rarely used. Remaining bonds not accounted for are occupied by chlorine atoms. A suffix of a lower-case letter a, b, or c indicates increasingly unbalanced isomers. As a special case, the R-400 series is made up of zeotropic blends (those where the boiling point of constituent compounds differs enough to lead to changes in relative concentration because of fractional distillation) and the R-500 series is made up of so-called azeotropic blends. The rightmost digit is assigned arbitrarily by ASHRAE, an industry organization. For example, R-134a has four fluorine atoms, two hydrogen atoms, two carbon atoms, with an empirical formula of tetrafluoroethane. The "a" suffix indicates that the isomer is unbalanced by one atom, giving 1,1,1,2-Tetrafluoroethane. R-134 without the "a" suffix would have a molecular structure of 1,1,2,2-Tetrafluoroethane—a compound not especially effective as a refrigerant. The same numbers are used with an R- prefix for generic refrigerants, with a "Propellant" prefix (e.g., "Propellant 12") for the same chemical used as a propellant for an aerosol spray, and with trade names for the compounds, such as "Freon 12." Recently, a practice of using HFC- for hydrofluorocarbons, CFC- for chlorofluorocarbons, and HCFC- for hydrochlorofluorocarbons has arisen, because of the regulatory differences among these groups. This page was last modified on 7 July 2015, at 19:51.